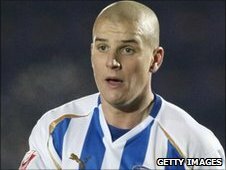 Colchester United full-back Marc Tierney has completed his move to Norwich City for an undisclosed fee. The 25-year-old has signed a two-and-a-half-year contract at Carrow Road, two years after current Canaries boss Paul Lambert brought him to Colchester. "I'm massively pleased to join what is a huge club," he told the City website. "I'm ecstatic to move to this club, it's a brilliant chance for me to ply trade in the Championship and there are a great bunch of lads here." Tierney's contract was due to expire in the summer and U's boss John Ward admitted he was unable to persuade the left-back to sign a new deal. He told BCC Essex: "We made Marc an offer, he turned it down and Norwich came in." Lambert told the Norwich website: "He was great for me at Colchester and his attitude for the game is top class. "He knows he'll have to fight for a place in the team, but it's great to have a squad with healthy competition for places." Tierney began his career as a trainee at Oldham and had a loan spell at Carlisle before joining Shrewsbury on a free transfer. He has not played for six weeks because of a combination of illness, a hernia operation and a knee injury. But when fit Tierney has been Colchester's first choice left-back, featuring 79 times in two years. He will face competition from Adam Drury and Stephen Smith for a place in Lambert's side at Carrow Road. The move comes despite Tierney saying he would not move to Norwich "in a million years" last season. Amid speculation Norwich were interested in him, he told the East Anglian Daily Times: "My girlfriend went shopping the other day and someone asked her if I was going to Norwich. "I'd just like to say that I would never in a million years go to Norwich. I can categorically say that." But he insists the comment was blown out of proportion: "I just moved to quash any rumours that I was coming here last year that were distracting my team at the time which was Colchester and there was no truth in it. "It got somehow blown up, but I'm delighted to be here and delighted to put my body on the line for Norwich and I'll do the best I can for the club." Ward added: "It's been going on for quite a while, it's not new to most people. "He's moving to the Championship, to a club that's realistically got a chance of moving up another level as well, so it's a good move for him." Meanwhile Ward has not ruled out reports linking Colchester defender Paul Reid with a switch to Scunthorpe. "People get asked about all sorts of things but I'm expecting Paul Reid to play on Friday [against Bournemouth]."